THURSDAY, March 24, 2016 (HealthDay News) -- The standard breast cancer screening test, mammography, may offer a surprising extra benefit -- the ability to check heart health, new research suggests. When radiologists look at mammograms for signs of breast cancer, they can also see calcium deposits that have built up in the arteries that supply blood to the breasts, said researcher Dr. Laurie Margolies. She's director of breast imaging at Mount Sinai Hospital in New York City. Women with large calcium deposits in their breast arteries have likely developed similar deposits in the arteries leading to the heart. These deposits are considered a very early sign of heart disease, the study authors said. And, calcium deposits in the breast arteries appear to be as strong a risk factor for heart disease as high cholesterol, high blood pressure and diabetes, the researchers said. If follow-up studies confirm these findings, a woman's mammogram could become a "two-fer" screening that covers both breast cancer and heart disease, Margolies suggested. "By adding no cost, no radiation and very little time, we can find calcification in the vessels," Margolies said. 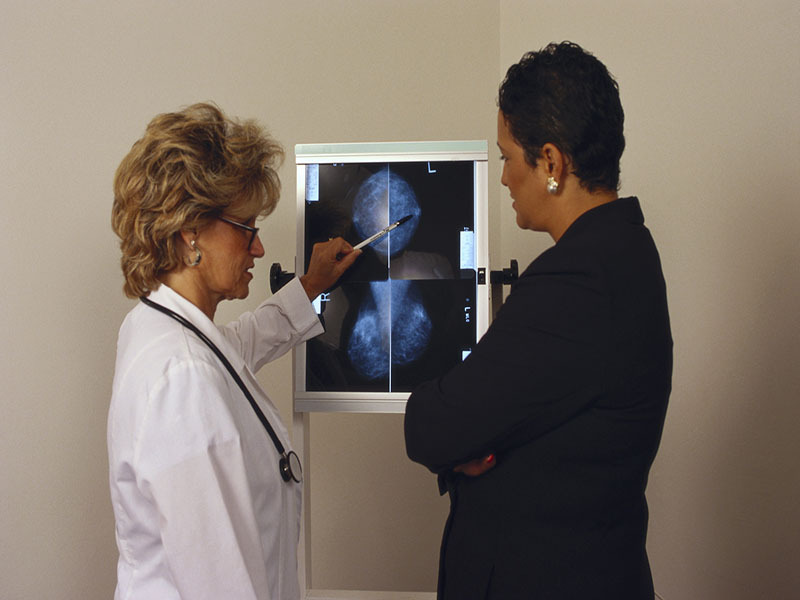 "This is potentially practice-changing in how radiologists read and report mammography. It's a revolutionary way to assess risk." Results from the study are scheduled to be presented April 3 at the American College of Cardiology's annual meeting, in Chicago. Findings presented at meetings are generally viewed as preliminary until they've been published in a peer-reviewed journal. The study included nearly 300 women who had digital mammography. The women also all had a separate, unrelated CT scan within a year of their breast cancer screening, Margolies said. The researchers reviewed the digital mammograms for signs of calcium deposits in the breast arteries. These deposits show up bright white in x-ray scans, Margolies said. About 42 percent of women in the study had these deposits. "We see those arteries very well on mammography, and if some arteries are calcified we see their calcifications very well," Margolies explained. The research team compared those results to the CT scans. The CT scans showed whether the heart's arteries were also calcified. The investigators found about seven out of 10 of the women who had evidence of breast artery calcification on their mammogram were also found to have calcium deposits in their heart arteries. Young and middle-aged women in danger of heart disease could particularly benefit from this "add-on" to their routine mammogram, said cardiologist Dr. Stacey Rosen. She's a spokeswoman for the American Heart Association and vice president of women's health for the Katz Institute for Women's Health at Northwell Health in New Hyde Park, N.Y. In the study, about half of the women younger than 60 with heart artery calcification also had calcium deposits in their breast arteries, the findings showed. If a younger woman had breast artery calcification, there was an 83 percent chance she also had calcium deposits in her heart arteries, the study revealed. "We know younger women don't appreciate their risk for heart disease as much as they should, and the preventive opportunities start young," Rosen said. Margolies said radiologists should consider adding an assessment of breast artery calcification in their breast cancer screening reports. She compared it to recent law changes that require radiologists to report breast density findings to mammography patients. "That was something that was seen by radiologists all the time but not reported, and women were clamoring to have that information," Margolies said. "I could envision this as the very same type of practice-changing revolutionary way of reporting and assessing risk." Radiologists also can reach out to cardiologists and specialists in women's health, forming preventive health partnerships. Radiologists could share data from mammograms to help protect patient's health, Rosen said. "Mammography reports are very structured in certain states, so the ability to potentially push the information into a patient report may at this time be limited," Rosen said. "But letting breast imagers know about these important findings may raise more opportunities for prevention."